Here's the female having a drink and occasionally looking up. 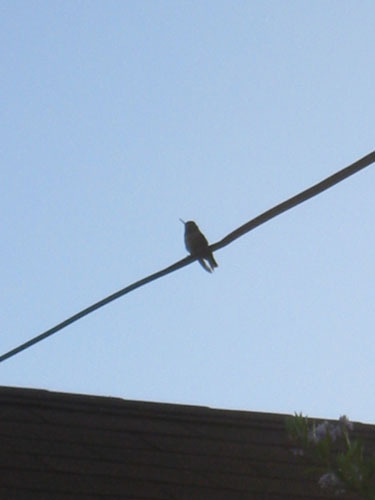 Her partner, keeping watch for other hummingbirds (he chased off two while I watched) from the electrical wire. I looked them up and these are Anna's Hummingbirds. The Chatty Cathy of the hummingbird world. If all hummingbirds made this much noise, they would have to have a very different name. Interesting note about something I read: it turns out that the concentration of the sugar nectar determines how often the birds will visit the feeder. 1:4 (sugar:water), the concentration I use, is weak, so they come back often but might choose a sweeter nectar preferentially. 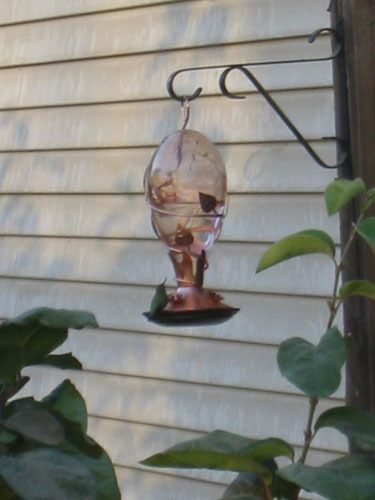 Researchers used a 1:2 concentration nectar to get the birds interested in a feeder, then slowly reduced the concentration. The sweeter the nectar, the less often the birds fed. Drought-tolerant plants like salvias tend to have a more concentrated nectar, so often hummingbirds will choose the flowers over the feeder, but won't visit them as often. I also live in Alameda and a hummingbird got into the house. My son took this picture of it. Hi, Janis (we met at a 4th of July party years ago! ), that's a great photo your son took. I've never had one even come close to getting in the house (though I guess they could come in through the holes in the eaves). That sounds really, um, exciting. Certainly it would wake the cats up.